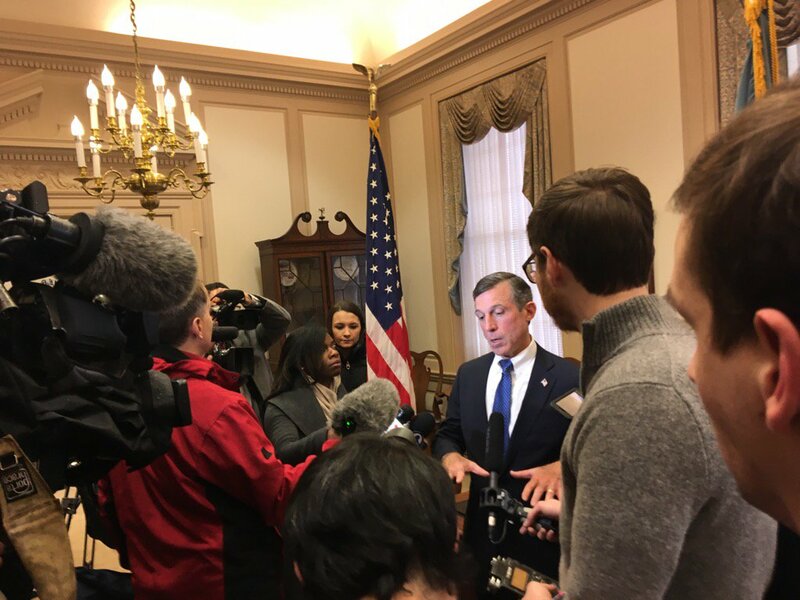 While Carney and his administration have been tight-lipped about the specifics of his budget, the governor has said it will require “shared sacrifice” throughout the state and has called for a “budget reset” that will put the state on more solid, long-term financial footing. The governor has spent the past few months attending legislators’ constituent meetings up and down the state, talking with citizens about what they want to see in his budget. That shared sacrifice must include sacrifice among the wealthiest Delawareans and corporations. And they must sacrifice first, before the poor, elderly, sick and the middle class. Itemized deductions on personal income tax would be completely eliminated, but the standard deduction would be increased 50 percent. Raises $18.1 million. Top personal income tax rate increases from 6.6 percent to 6.8 percent, at $60,000. Raises $9.9 million. Raise eligibility to age 65 for pension deduction and extra tax credits. Eligible age is 60 right now. No new revenues are anticipated for next year, but would save the State $18M in out years. Corporate Franchise Tax: raised to match inflation, with a new new top rate — $250,000 for companies with $750 million or more in revenues or assets. Raises $115 million. Cigarette tax increases from $1.60 a pack to $2.60 a pack. Raises $18.6 million. Realty transfer tax would increase from 1.5 percent to 2.5 percent. Raises $44 million. State cuts the share of the realty transfer tax that goes to counties by 50% to 0.25 percent. Raises $11M (and puts an $11M hole in county budgets). State employees pay more for health care. Now all State Plans would have a deductible, and existing deductibles would increase. Saves $24 million. The subsidy that pays up to $500 of senior citizens’ property tax bills would be eliminated. Saves $25 million. All State department budgets would be cut. Saves $56 million all in. A senior citizen prescription drug program is eliminated. Saves $9.4 million. The state reduces its share of the cost of transporting students from 90 percent to 70 percent. Saves $14 million. The state reduces its share of school construction from (60 – 90%) to 50%. The state would only pay for 50 percent of new school construction; currently, it pays 60 to 80 percent. This applies to new construction projects only. Grant-In-Aid would be reduced, eliminating the partnership with the Paramedic Programs (saves $10+M) and reducing funding to Community Agencies by $1.6M. It is simply insane that a family of four making $60,000 pays the same rate as some rich DuPont earning $600K a year off of interest. If we are seriously talking about Shared Sacrifice, this flat tax system must end now. Indeed, any serious budget proposal would include a new progressive tax structure similar to what I propose below. Any budget without it must be considered dead on arrival in the General Assembly. Change them to something like this (you can play around with the rates). Notice how the lower and middle classes actually get a tax cut with this new structure? Only people making over 100k will see a tax increase of varying degrees. Of course, I am not the JFC so I have no properly scored this proposal. Still, we need at least 3 new top level brackets. I just want to note that John Carney basically skipped on Wilmington budget meetings. The one held in January basically highjacked Rep. Bolden’s yearly meeting with her District’s community association leaders. People in Wilmington had to either travel to one of the meetings outside of the city or get to the Town Hall phone conversation. While he conducted two of them in the Hockessin area. So I haven’t looked at this too closely yet, but Carney’s budget largely seems to preserve the revenue raising items that Markel proposed. I don’t recall the spending cuts as well, but I think Carney’s health cost shifts are less than Markell’s and I don’t recall about the vacants. And does the Carney budget also give schools the power to raise their portion of property taxes with no referendum? The school property tax thing was a point of confusion yesterday, but in short: no he didn’t propose doing away with the referendum process. There’s $37 million in public ed funding on the block: $22m from state Education Sustainment Funds (ESF) and $15m from general District & Charter operations. What he is proposing is authorizing Districts to recover their portion of the $22m cut to ESF by making ESF Recovery an eligible category for the “Match” Tax component of school taxes. “Match” Tax rates do not require referendum to change, local School Boards adjust them each year in order to generate revenue to “Match” funds the General Assembly provides for certain categories of spending…even though in the case of ESF, there will be no State match. It is essentially a “Replacement” Tax to generate the funds the State just yanked away out of local property taxes. Even though it would hit my family I like cassandram’s income tax proposal. Having the highest tax bracket at $60K is ridiculous. I have had a discussion with Harris McDowell about a tax scheme similar to what cassandram posted here and it makes sense. I agree that this is a great income tax proposal, even though I’d pay more too. But DD created this proposal, I think, not me.